Coburg's most homely, welcoming neighbourhood diner-style brunch spot. 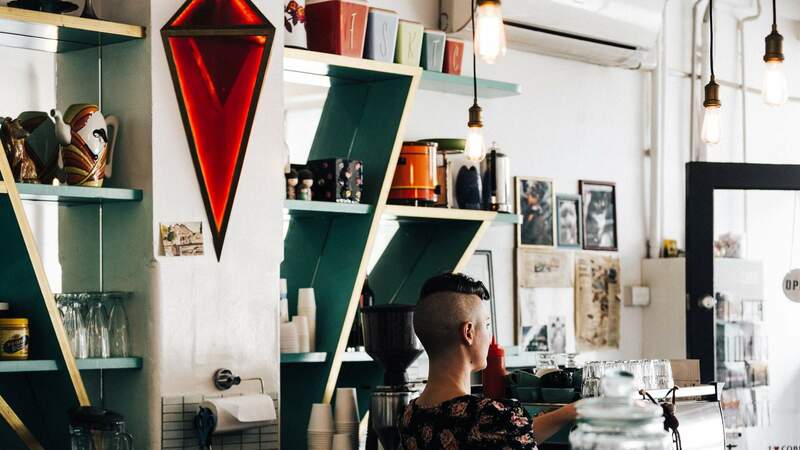 After a shaky start, having been broken into within its first month of opening, this retro diner-style cafe in coffee-barren Coburg is fast becoming a popular little hangout. Ruby's is full of personality, which is down to the influence of owners Becky and Mik Tsatsis. Mik's Greek heritage shines through on the menu (haloumi, Greek yoghurt and feta all feature, and there is a spanakopita available for lunch), while wife Becky is the smiling face you see serving customers. And the namesake Ruby? It's the gorgeous cocker spaniel owned by the pair. What the menu lacks in sophistication it makes up for in individuality; think banana and nutella jaffles ($8), nutella and peanut butter milkshakes (groan) and even a French Kiss — French toast made with Greek sweetbread served with yoghurt, house-made lemon curd, red berries and maple syrup ($14). There is of course the regular breakfast fare, lunch specials and plenty of baked treats (often including gluten-free and vegan options), plus a milkshake menu that is fast making a name for itself. With such wondrous combinations as the aforementioned nutella and peanut butter, you also choose from raspberry, flaked almond and pomegranate and a spiced chai with chocolate ice cream. The coffee is a pleasant surprise, with beans from Padre made by a barista who clearly knows what to do with them. All this is packaged into an atmosphere that feels like the living space of your coolest friend's northside share house where everyone's happy to welcome new visitors (and there's a cute courtyard out the back for sunny mornings). The decor is distinctly Art Deco, with turquoise, black and brassy-gold accents, while the retro furniture has clearly been collected from all over the place. The walls function as a gallery space, adorned with artworks by a rotating list of artists which are all available for purchase. Not trying to follow the modern sophisticates of the cafe scene, Becky and Mik have instead chosen to provide a homely, welcoming neighbourhood brunch spot and one for which Coburg was truly crying out.